1. Brazil football superstar Marta. Marta Vieira da Silva, known as just Marta, is a superstar of women’s football. The 30-year-old, dubbed as “Pele in skirts,” wants to finally prove that second is not good enough for the Brazilian women long time in the shadows of their star-studded men’s team, who are holders of five World Cup titles. Winner of the FIFA’s women’s world player on the year five times, she helped Brazil to silver in Athens and Beijing, but despite her international honours has never won a major title with Brazil. As fellow Olympian Neymar earns millions from the sport, Marta, who grew up playing football in the streets with boys, has often struggled to make a living from the sport with seven of the eight teams she has played for going bankrupt. “Brazil is specially known as the country of soccer, but men’s soccer. (The Olympics) is an opportunity to change that,” Marta said. Unbeaten since women’s wrestling was included to the Olympics in Athens in 2004, Yoshida, 33, is the most decorated athlete in freestyle wrestling, with three consecutive Olympic gold medals and 13 world championship titles. The 33-year-old will be bidding for a fourth consecutive Olympic title in the 55kg class. 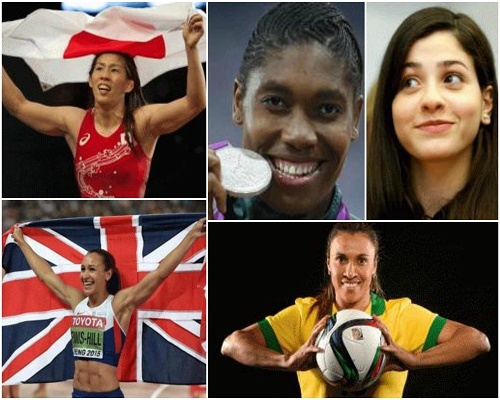 She carried the Olympic flag in London and in Rio will be the first woman to captain the Japanese team. The greatest female wrestler of all time was introduced to the sport at a very early age by her father, the late Eikatsu Yoshida, an Olympic freestyle champion and national team coach. She has had unprecedented success on the international scene in the 55kg and then the 53kg categories. “I am not settling for three golds in a row. I now want to try for a fourth,” she warned. Yusra Mardini swam for her life when she fled his native Syria less than a year ago. In Rio the 18-year-old will be swimming for a medal in the 100 meters butterfly and 100m freestyle as along with Rami Anis she will represent the refugee team in Olympic swimming. The Germany-based athlete is competing just 11 months after she plunged into the freezing Aegean Sea to help push a sinking dinghy, overcrowded with 30 migrants, to safety. For three hours, she, her sister Sarah and another woman took turns to push the boat to safety. Life took her to Germany, and then Rio and on August 5 it will be “pride, happiness and butterflies in the stomach” she will carry the flag of the first team of IOC refugees, accompanied by Anis, and eight other athletes without a country. “We are human beings who lost our home and we are trying to rebuild our lives. Many things have happened, but at some point you have to move on,” said Mardini. Next : 7 Incredible Health Benefits of Pickle Juice: Drink Up!